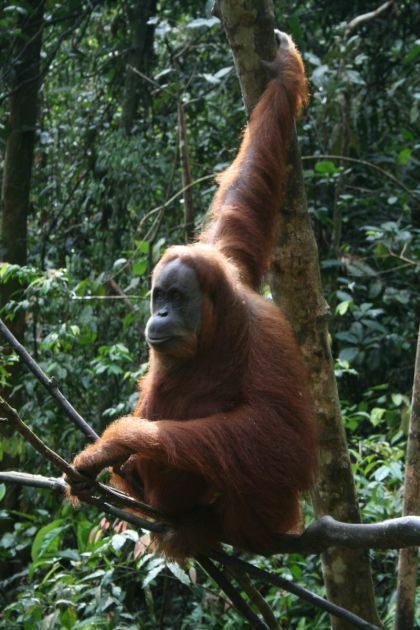 I just came back from a weekend in Bukit Lawang. Bukit Lawang is about a three hour, bumpy bus ride from Medan and is apparently one of the best places for seeing orangutans in the wild. 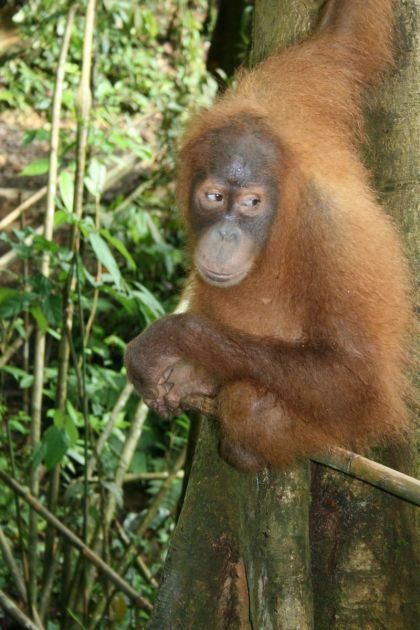 It was my second trip to Bukit Lawang, but the first time to see orangutans. There is a feeding area where National Park staff feed the orangutans two times a day – at around 8:30 a.m. in the morning and 2:30 p.m. You need to pay an entrance fee of around 20,000 rupiah for foreigners and 50,000 rupiahs to take photos. 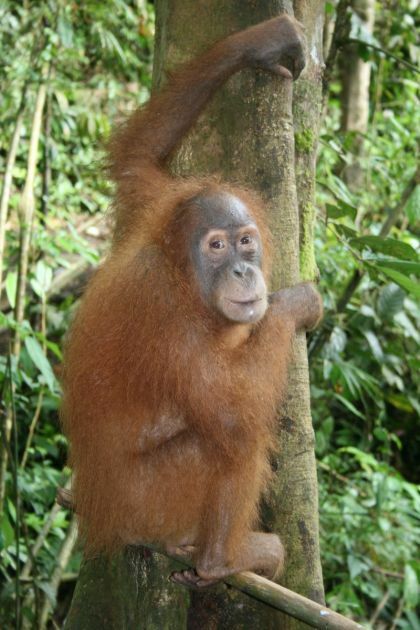 When you arrive in Bukit Lawang you will be met by one of the many “guides” who won’t leave you alone until you book a trekking trip with them. It is easy though to get to the feeding station without a guide. When it is close to feeding time, just keep going up the river past the “Jungle Inn” hotel, where there is a small boat to take you across the river. You can pay your money there or at the National Park office near where the becaks (motorized rickshaws) park. The National Park guide said morning was better to see more orangutans. I was only able to see two, but the previous day there were seven. 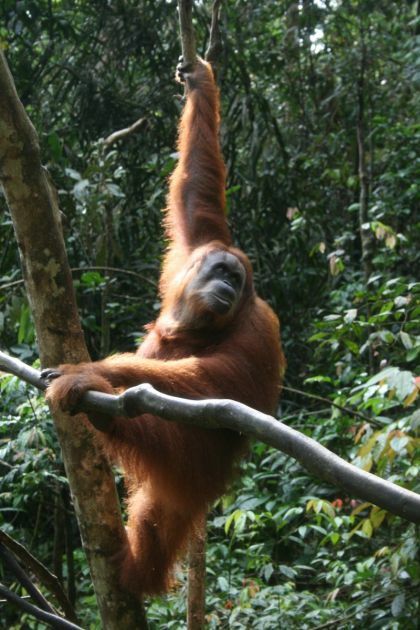 The orangutans live in the wild and make their way to the feeding station if they need food. The park rangers feed them milk and bananas. It was incredible to see them up so close, just a meter or so away. They looked at us while we took pictures. 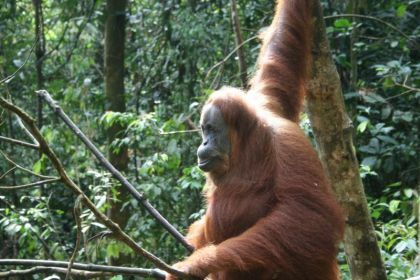 The larger orangutan was 5 months pregnant. 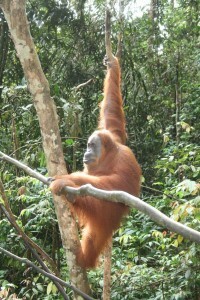 There are only around 7,000 orangutans left in Sumatra according to Wiki and they could be extinct by 2012. They are beautiful and amazing creatures and it would be a huge loss to see them become extinct. Apparently 96 per cent of their genes are the same as humans. The forests are being logged for timber and the land is used for palm oil and rubber plantations. The park entrance fees are sent to the government, but little of that makes it way back to the National Park. The guides said they hadn’t been paid for two months. 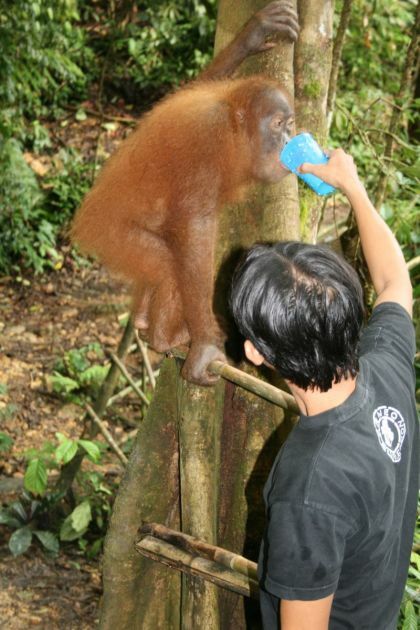 I guarantee that anyone who makes the trip to see the orangutans, you will come back an ardent conservationist.